The Waste Isolation Pilot Plant officials stated that there was another radiological release on March 11. This was outside of the WIPP site exhaust shaft filter. An air sample from the outside of the ventilation exhaust recorded 61 disintegrations per minute of americium on a sample collected the evening of March 11. WIPP stated that, “This is expected given the amount of contamination captured by the WIPP ventilation system during the February 14 radiation release event. Engineers believe the contamination was from previous deposits on the inner surface of the exhaust ductwork.” The engineers did not state why they expected this and did not mention the LARGE amount of contamination captured by the WIPP ventilation system filters. The engineers also did not state why they believed this and not that more contamination was being produced in the underground. Air sampling results before and after the High Efficiency Particulate Air (HEPA) filters at WIPP are available here. Station A samples air before the filters and Station B samples air after passing through the filters. These samples were analyzed following the detection of airborne radioactivity on February 14, 2014. They are not environmental samples, and are not representative of the public or worker breathing zone air samples. There was a larger event, before the filters, that occurred 03/13/2014 08:30 AM (368 dpm) that has not been mentioned. All this shows that the underground could still be brewing radiological activity. Perhaps this will be explained better tonight at the Town hall. Weekly Town Hall Meetings in Carlsbad? Thursdays at 5:30 – Carlsbad City Council Chambers, City Hall, 101 N. Halagueno St. Discuss recovery efforts following WIPP’s fire and radiological events in February. The Department of Energy (DOE), is proposing to ship transuranic waste currently located at the Los Alamos National Laboratory (LANL) for temporary storage at Waste Control Specialists (WCS), located in western Andrews County, Texas. LANL has another ~546 cubic meters remaining out of the original 3706 cubic meters that was agreed to be moved to WIPP by June 2014. Let’s be clear, there is no technical reason to store the waste temporarily at WSC. DOE and LANL just want to show that they can meet a deadline. The extra cost of this operation has not been released. And don’t get me wrong, no one wants the waste – all the waste – removed from LANL more than me. Let’s hope that DOE and LANL show the same amount of interest and resources when it comes to removing the rest of the waste at Los Alamos, such as the hundreds of thousands of cubic meters of radioactive and hazardous wastes buried at Area G.
A WIPP informational meeting will take place in Santa Fe on Monday, March 31st from 6 to 7:30 pm at the Santa Fe Main Library, located at 145 Washington, in downtown Santa Fe. Please note the new location. Don Hancock, of Southwest Research and Information Center, Scott Kovac, of Nuclear Watch New Mexico, and Sasha Pyle, longtime activist, will give presentations. Opportunities for public involvement will be discussed. Santa Fe, NM – The Obama Administration has finally released its detailed budget for fiscal year 2015, which starts October 1. By law the president’s proposed budget is required to be released not later than the first Monday of February. Contrary to President Obama’s rhetoric about a future world free of nuclear weapons, most famously expressed in his April 2009 speech in Prague, the President asks for a 7% increase for nuclear weapons research and production programs under the Department of Energy’s semi-autonomous National Nuclear Security Administration (NNSA). NNSA’s “Total Weapons Activities” are slated to rise to $8.3 billion in FY 2015, and to an astounding $9.7 billion by FY 2019, 24% above this current fiscal year 2014. Obama FY 2015 budget request sets a new record for DOE nuclear weapons spending, even exceeding the Cold War high point in 1985 under President Reagan’s military buildup. Of particular interest is the hands-on nuclear weapons work in the budget category “Directed Stockpile Work,” increased by $305 million (or 12.5% above FY 2014), whose overwhelming focus is Life Extension Programs (LEPs). President Obama wants $634 million (+20%) for the B61 nuclear bomb LEP, which has already exploded in costs from an originally estimated $4 billion to more than $10 billion. Each bomb will end up costing more than twice its weight in gold. In addition to extending the service life of the bomb by decades, this Life Extension Program will combine three tactical or “battlefield” variants and one strategic variant together into one all-purpose nuclear bomb. The LEP will also transform the B61 from a simple analogue bomb into a digital bomb that interfaces with future super-stealthy fighter aircraft, which themselves will cost an astronomical $1 trillion (although not all will be assigned to a nuclear mission). A separate $1.8 billion Defense Department program for a new tail fin guidance kit will transform the B61 into the world’s first nuclear smart bomb. Despite all this, the U.S. government denies that it would ever endow existing nuclear weapons with new military capabilities. The construction of the Uranium Processing Facility at the Y-12 plant is capped at $6.5 billion. A recent study by the Pentagon’s Office of Cost Assessment and Project Evaluation predicted that this exorbitant facility, originally estimated by NNSA at ~$600 million, would cost between $12 to 19 billion. To bring it in at $6.5 billion NNSA has cut out all dismantlement and HEU downblending operations, making it a production-only nuclear weapons plant (pp. 319-323). NNSA’s budget “Defer[s] the W78/88-1 LEP to some date beyond FY 2019” (p. 84), effectively meaning its cancellation. The W78/88-1 LEP was to produce a proposed “interoperable warhead,” using the plutonium pit from a third warhead, the W87. Nevertheless, the Los Alamos National Laboratory plans to “Build W87-design developmental pits each year to sustaining [sic] fabrication capability” (p. 117). The controversial Chemistry and Metallurgy Research Replacement (CMRR) Project for expanded plutonium pit production remains abandoned, but NNSA plans to raise the amount of plutonium used in the already constructed Rad Lab and pursue “pre-conceptual design efforts for the modular acquisition concept” to substitute for the CMRR (p. 219). NNSA still plans to “Execute a plutonium strategy [at LANL] that achieves a 30 pit per year capacity by 2026,” (p. 70) for which it gives no clear requirement or reason. Key nonproliferation programs designed to halt the spread of nuclear weapons have been slashed by $300 million (-21%), even though nuclear weapons are recognized as the greatest existential threat to the United States. “Defense Environmental Cleanup”, the nation-wide program to clean up the Cold War legacy of radioactive and toxic contamination, is being cut from $5.8 billion to $5.6 billion, despite the fact that estimated costs keep climbing. All of this is evidence of a pattern where the U.S. will spend massive amounts on nuclear weapons “modernization,” while nonmilitary domestic services are cut or flat lined. In December 2013 the nonpartisan Congressional Budget Office (CBO) released its study Projected Costs of Nuclear Forces 2014 -2023. Its stunning conclusion was that estimated costs for maintenance and “modernization” of the nuclear weapons stockpile, delivery systems, and research and production complex would total $355 billion over the next decade. The CBO also reported that costs after 2023 would increase yet more rapidly since “modernization” is only now beginning. The report did not attempt to project costs for maintenance and modernization of nuclear forces over the planned period of the next thirty years, but given current trends it will easily exceed one trillion dollars. In one piece of good news the NNSA is finally putting the Mixed Oxide (MOX) Fuel Fabrication Facility at the Savannah River Site in South Carolina in “cold standby.” The MOX program is a failed attempt in the laudable goal of disposing of 34 metric tons of weapons-grade plutonium. The MOX Program’s life cycle costs have exploded to an estimated $30 billion, and NNSA is now studying cheaper alternatives. This has major positive impacts on the Los Alamos National Laboratory (LANL), which was slated to process 2.5 metric tons of plutonium every year as feedstock for the MOX Fuel Fabrication Facility. It also further undermines the need to build massive new plutonium facilities at LANL. The FY 2015 DOE nuclear weapons request is calculated as the highest ever using data from Atomic Audit, Brookings Institute, 1998, Stephen Schwartz editor, Table A-2. It gives 5.494 billion in 1996 dollars as the cost for DOE nuclear weapons research, production and testing programs in 1985. Adjusted for inflation that is $8.259 billion in 2014 dollars. The salt haul truck that caught fire was approximately 29 years old. Carlsbad Mayor Dale Janway and DOE will co?host weekly town hall meetings to update the community on recovery activities at WIPP. The meetings will be held every Thursday at 5:30 p.m. at the Carlsbad City Council Chambers, 101 N. Halagueno Street. If you can’t attend, you can view the meeting on line at http://new.livestream.com/rrv/wipptownhall. Here is a video of the March 6 DOE WIPP Town Hall. We now have a look at DOE’s predicted contamination spread, available at the Waste Isolation Pilot Plant (WIPP) update page. What caused this release in the first place? How contaminated is the underground? Are soil samples being collected? From where? In a March 9th press release, the Nuclear Waste Partnership (NWP), the management and operations contractor at the Waste Isolation Pilot Plant (WIPP) for the U.S. Department of Energy (DOE), stated their plans to reenter the ailing salt mine/nuclear waste repository after a radiological release shut down operations over three weeks ago. The press release tells us that, on March 7 and 8, radiological and air quality instruments were lowered down the Salt Handling and the Air Intake Shafts. The preliminary findings indicated that no “detectable radioactive contamination” in the air or on the equipment. The press release claims that these results were expected because the shafts that were sampled were not in the air flow path coming from the area where the radiation release originated. But, there are 4 shafts to underground – the Salt Handling, the Air Intake, the Waste Handling, and the Exhaust Shafts. After the detection on a radiologic release, filters move into the Exhaust Shaft and air is drawn to the outside by fans blowing to the outside here. The other three shafts, mainly the Air Intake Shaft because it has no elevator in it, provide intake for the air flow path to the Exhaust Shaft. Strangely missing from the press release is any mention of the Waste Handling Shaft, which contains an elevator to take the waste down into the mine and should also have been out of the air flow path. DOE and NWP must explain why the Waste Handling Shaft was not sampled and, if it was, what are the results. The Waste Handling Shaft provides the normal entry to the underground, so why use the Salt Shaft? Also, the press release did not mention that any “soil” samples were taken from the walls of any of the shafts. Is the Waste Handling Shaft contaminated or presumed contaminated? As far as the air flow path goes, it’s an elaborate game to get the air to flow where it is needed in the underground of WIPP. Getting the desired path requires blocking off numerous openings in the underground. Bob Martin from KRQE gave a hint of what is involved in his recent report. We have not been given the diagram for the air flow path at the time of the release or even if the path was in place. We don’t have the location of all the monitors in the underground and if they were working. What was the presumed path of the contaminated air to the Exhaust Shaft? Why are so many details left out out of the information released to the public? Unfortunately, the press release also mentioned that four more WIPP workers had been contaminated. But it was not stated where or when these employees received the dose. Was it Friday night or Saturday? Why was this important information not in the press release? We also have some new sample findings released. Some of the interesting information here is that the WIPP Laboratory Analyses are so much lower than the Screening Analyses. I will get back to you on that. But don’t forget that it is unlikely that the main release actually hit any of the air monitors dead-on. Also, notice the lack of samplers to the northeast. We will have to wait for soil samples to come in before we can begin to estimate the main path of the release. WIPP is not a secret facility. (They even let me down there last year.) Press releases that raise more questions than they answer must stop now. The world’s first geologic repository for military nuclear waste is making international news because of the radiation leak that was detected late at night on Valentine’s Day. An unknown amount of radioactive and toxic chemical waste was released to the environment from the Waste Isolation Pilot Plant (WIPP). On February 26, the 13 workers at the site when the leak was detected were notified that they tested positive for internal radiation contamination. Since the Department of Energy (DOE) and Nuclear Waste Partnership (NWP), the operating contractor, have repeatedly stated that WIPP would “start clean, stay clean” and not release any radioactivity for at least 10,000 years, the leak was never supposed to happen. The health danger that persists for thousands of generations is the reason to put the wastes underground so they are not released to the environment. Thus, an obvious question: What’s wrong with WIPP? Also, what effect does the leak have on DOE plans to expand WIPP and what is the opposition to such proposals? * What caused the leak? * How much leaked into the underground salt mine? * How much leaked into the environment? * Where are those radioactive and toxic wastes now? * To what amount of radiation were the workers exposed? * What are the health effects for those workers? * What decontamination is necessary in the underground mine? * What decontamination is necessary on the WIPP site and surrounding area? * If WIPP reopens, what changes in the operation, monitoring, and safety culture will be implemented? “I am very concerned about the recent detection of radiation near WIPP and the health and safety of those exposed to radiation. It will be important that answers are provided detailing the causes of the elevated levels and how this will be prevented in the future. The safety and security of the community must be the top priority. The Obama Administration has released topline numbers for its FY 2015 budget for the National Nuclear Security Administration (NNSA), which owns the nation’s nuclear weapons complex of design laboratories and production plants. The NNSA’s budget category “Total Weapons Activities” is slated to be increased to $8.3 billion, $534 million above FY 2014 (+ 6.9%). Of particular interest is “Directed Stockpile Work,” increased by $305 million (+12.5%), whose overwhelming focus is Life Extension Programs. These programs not only extend the operational lives of existing nuclear weapons by decades, but also arguably give them new military capabilities, despite denials at the highest levels of government. Details are not yet available, but the increase for Directed Stockpile Work will probably mostly be for the B61 Life Extension Program. Its refurbishment of each nuclear bomb will cost more than twice their weight in gold. This is the beginning of a pattern where the U.S. will spend massive amounts on nuclear weapons “modernization,” while nonmilitary domestic services are cut or flat lined. In December 2013 the nonpartisan Congressional Budget Office (CBO) released its study Projected Costs of Nuclear Forces 2014 -2023. Its stunning conclusion was that estimated costs for maintenance and “modernization” of the nuclear weapons stockpile, delivery systems, and research and production complex would total $355 billion over the next decade. The CBO also reported that costs after 2023 would increase yet more rapidly since “modernization” is only now beginning. The report did not attempt to project costs for maintenance and modernization of nuclear forces over the planned period of the next thirty years, but given current trends it will easily exceed one trillion dollars. In stark contrast, key nonproliferation programs designed to halt the spread of nuclear weapons have been slashed by $300 million (-21%), even though nuclear weapons are recognized as the greatest existential threat to the United States. “Defense Environmental Cleanup”, the nation-wide program to clean up the Cold War legacy of radioactive and toxic contamination, is being reduced from $5 billion to $4.87 billion, despite the fact that estimated costs keep climbing. In one piece of good news the NNSA is finally putting the MOX Fuel Fabrication Facility at the Savannah River Site in South Carolina on “cold standby.” The MOX program is a failed attempt in the laudable goal of disposing of 34 metric tons of weapons-grade plutonium. The MOX Program’s life cycle costs have exploded to an estimated $30 billion, and NNSA is now studying cheaper alternatives. This has major positive impacts on the Los Alamos National Laboratory (LANL), which was slated to process 2.5 metric tons of plutonium every year as feedstock for the MOX Fuel Fabrication Facility. 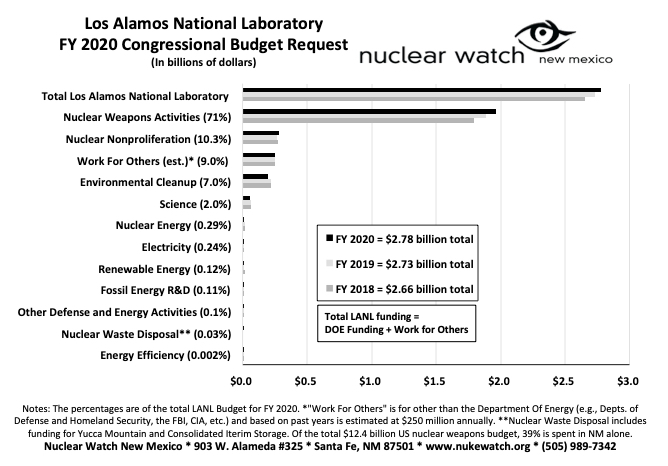 It also further undermines the need to build massive new plutonium facilities at LANL. 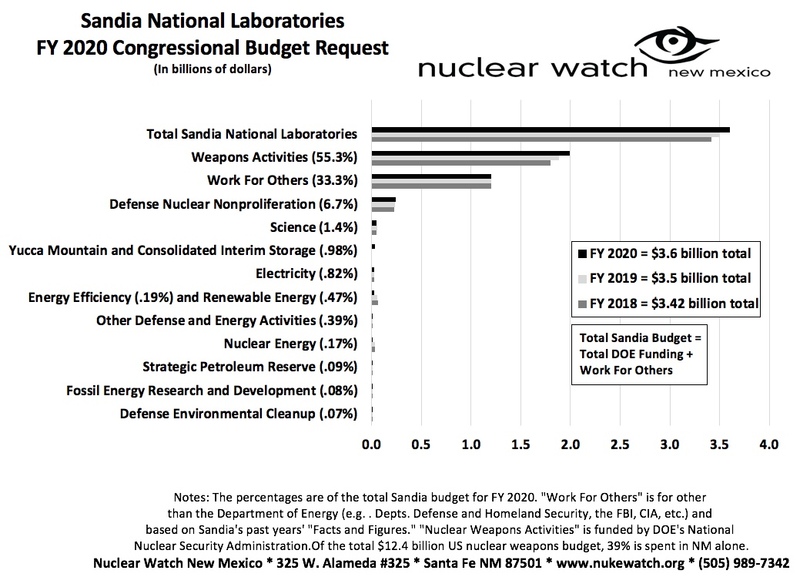 The U.S. nuclear budget is out of control. Huge cost overruns for unnecessary production facilities are common. At the same time, cleanup of radioactive and toxic pollution from weapons research, testing, production and waste disposal is falling behind. The Department of Energy (DOE) budget for FY 2015 will reveal the Obama Administration’s nuclear priorities. The Alliance for Nuclear Accountability (ANA), a 25-year-old network of groups from communities downwind and downstream of U.S. nuclear sites, will be looking at the following issues. For details, contact the ANA leaders listed at the end of this Media Advisory. — Does the budget reflect the Administration’s commitment to curtail unnecessary spending on the $19 billion Uranium Processing Facility at Oak Ridge by downsizing it to the capacity needed to support stockpile surveillance, maintenance and limited life extension? — Does the budget address the looming deficit in nuclear weapons dismantlement capacity so the United States can meet its international arms reduction commitments? — Will the Obama Administration articulate its alternative plutonium strategy to the $6 billion “CMRR Nuclear Facility,” which was effectively cancelled in 2012? Is any expanded production needed when expert studies have found that existing plutonium pits are durable? — Will NNSA reduce funding or impose meaningful milestones at the National Ignition Facility (NIF), which performed less than half of its planned Stockpile Stewardship experiments in FY2013 and still has not achieved ignition. — Is the budget a de facto cancellation of plans to pursue “interoperable warhead designs” by imposing a delay of five years or more on the program? How much money will taxpayers save? — Does the FY 2015 budget seek more than the $537 million requested for the B61 Life Extension Program last year? Will the “First Production Unit” from this $10 billion program continue to slip to 2020 or later delaying needed routine replacement of critical components? — How much of the additional $26 billion in Defense Sec. Chuck Hagel’s “Opportunity, Growth and Security Initiative” will go to DOE nuclear weapons programs? — Will the Administration support increased funding for the Defense Nuclear Facilities Safety Board (DNFSB) to provide independent oversight of DOE projects given the many cost over-runs, schedule delays, safety issues and technical problems? — What is the projected life-cycle cost of the plutonium fuel (MOX) program at Savannah River? Is DOE’s internal cost assessment consistent with ANA’s estimate of $27 billion? When will it be released? Have any nuclear reactor operators committed to using MOX fuel? — Does the Request include continued funding for design and licensing of Small Modular Reactors (SMRs), which private investors have been unwilling to finance fully because of concerns about viability and risks? Does DOE have plans to finance SMR construction? —How much additional Environmental Management (EM) funding would be necessary in FY 2015 to meet all legally mandated cleanup milestones? States say cleanup agreements at a dozen major sites are underfunded by hundreds of million dollars. — In which states does DOE face fines and lawsuits for missing milestones due to budget shortfalls? Which states are enforcing their binding clean-up agreements by imposing fines and taking further legal action? — What is the high range for total life-cycle clean-up costs (LCC) for EM sites Because of funding shortfalls, are LCC costs continuing to increase? In the FY 2013 Budget Request High Range LCC was $308.5 billion, and in the FY 2014 Request LCC was $330.9 billion. — Does the FY 2015 Request include funds to cleanup contamination from the recent radiation release at the Waste Isolation Pilot Plant (WIPP)? How much will this incident delay shipments from the Idaho National Lab, Los Alamos, Savannah River, and Oak Ridge? — How much money is included for construction of new double-shell tanks to replace those leaking radioactive waste at the Hanford site? Are funds included for emergency pumping of tanks found to be leaking? — Is DOE allocating sufficient funds to monitor and address ignitable hydrogen gas buildup in Hanford’s nuclear waste tanks as recommended by the Defense Nuclear Facilities Safety Board to protect workers, the public and the environment from possible explosions? — Is an independent review of the Hanford Waste Treatment Plant included in the budget request to address concerns about the reliability of many of the parts and materials? –– How much money is DOE allocating for building and development of the Hanford Waste Treatment Plant based on the current, flawed design and how much on redesign? I’ll remind us all that the Waste Isolation Pilot Plant (WIPP) site is NOT a National Security site. It is a fancy landfill. There are really no secret programs there to protect. Maybe there are some secret parts buried there, but they have long-since been crushed. There is no reason to withhold news. The waste streams are well known and exactly where they are emplaced in WIPP is also well known. When the public gets news from WIPP officials, we deserve to have our questions answered clearly with all the important facts included. Our best wishes go out to the employees. Here’s the February 26, 2014 letter from the U.S. Department of Energy – Carlsbad Field Office, which provides oversight of the private contractor, Nuclear Waste Partnership, LLC, that currently manages and operates WIPP. Unfortunately, this letter raises many questions. Below are each of the paragraphs of the letter, followed by my questions and comments. This morning (February 26), the 13 Waste Isolation Pilot Plant (WIPP) employees that were on site the evening of February 14 were notified that they have tested positive for radiological contamination. Employees were notified within about 12 hours of the receipt of preliminary sample results. How many employees were onsite when? Were the 13 contaminated employees essential or non-essential? Were the non-essential employees (how many?) that left by 5:30 bioassayed? How does an employee inhale rads and not have any on them? At the time of the event, these employees were performing above ground operations, and federal oversight duties at the WIPP facility. Nuclear Waste Partnership, LLC, the site contractor, requested that all workers on site the night of the event submit follow-up bioassay samples as they were considered more likely to have indications of potential exposure. Additional samples will be collected from these employees in the weeks ahead in order to perform complete analyses. When did Nuclear Waste Partnership, LLC request the bioassay samples from the night workers? What made them “more-likely” to be exposed? What exactly were they doing? Were the non-essential employees (how many?) that left by 5:30 bioassayed? When was this request made? It is premature to speculate on the health effects of these preliminary results, or any treatment that may be needed. However, on-site sampling and surveys and environmental monitoring, to date, continue to support National Atmospheric Release Advisory Center (NARAC) modeling, which indicates that airborne contamination was likely at very low levels. Where is the National Atmospheric Release Advisory Center (NARAC) modeling? The public must be allowed to read any and all reference documents. And by the way, NARAC is located at the Lawrence Livermore National Laboratory, which is a Department of Energy site. The material for this release event is transuranic radionuclides. The release material was predominantly americium-241, material which is consistent with the waste disposed of at the WIPP. This is a radionuclide used in consumer smoke detectors and a contaminant in nuclear weapons manufacturing. As long as the radiation source stays in the detector, exposures would be negligible (less than about 1/100 of a millirem per year), since alpha particles cannot travel very far or penetrate even a single sheet of paper, and the gamma rays emitted by americium are relatively weak. If the source were removed, it would be very easy for a small child to swallow, but even then exposures would be very low because the source would pass through the body fairly rapidly (by contrast, the same amount of americium in a loose powdered form would give a significant dose if swallowed or inhaled). Still, its not a good idea to separate the source from the detector apparatus. All the americium at WIPP is the byproduct of Cold War nuclear weapons production. The Center for Disease Control (CDC) explains the health effects of americium. The radiation from americium is the primary cause of adverse health effects from absorbed americium. Upon entering the body by any route of exposure, americium moves relatively rapidly through the body and is deposited on the surfaces of the bones where it remains for a long time. As americium undergoes radioactive decay in the bone, alpha particles collide with nearby cell matter and give all of their energy to this cell matter. The gamma rays released by decaying americium can travel much farther before hitting cellular material, and many of these gamma rays leave the body without hitting or damaging any cell matter. The dose from this alpha and gamma radiation can cause changes in the genetic material of these cells that could result in health effects such as bone cancers. Fifth Paragraph – Here it states that inhalation did employees did occur. Determining employee dose typically involves multiple sample analyses to determine employee’s radionuclide excretion rate over time. This allows the lab to estimate the employee’s accumulated internal dose. The time this process takes depends largely on the solubility of the inhaled particulate, with less water-soluble radioactive materials requiring more samples and time to accurately estimate the dose. Follow-up urine samples may require about three or more weeks to accurately predict dose. We are now focusing our sampling program on employees with work assignments that may have placed them at greater risk, including those on shift February 15. We are still reviewing staff assignments to determine if additional employees will need to be tested. However, employees who feel they were assigned positions or functions that placed them at risk will be included in follow-up bioassay monitoring at their request. How many employees were working on the 15th? Were they wearing safety protection? What is the criterion “to determine if additional employees will need to be tested”? There is no risk to family or friends of these employees. As we learn more information, we will continue to share. If you have any questions or concerns, please contact 1-800-336-9477. Thank you. What is the current status at the site? Are employees working there now? Are they wearing protective gear? There apparently is a Press Conference today (Feb27 2014) at 3pm MST. This is a good example of what is known, what is being said, and what is not being said. But late on Feb. 14, at an hour when no one was in the mine, an air monitor indicated the presence of radioactive contamination. An automated system cut off most of the ventilation and routed the exhaust through filters that are supposed to capture 99.97 percent of all contamination, turning off fans and changing the air flow, in less than one minute. At WIPP, there are 4 ways for air to get to the surface – the Exhaust Shaft, the Salt Shaft, the Air Intake Shaft, and the Waste Handling Shaft. When radioactive contamination is detected, airflow is directed to the Exhaust Shaft as its filter is put into place. This shaft has the only filter and monitors on any of the shafts. WIPP officials claim that it was a monitor in Panel 7 that detected radiation and set into action the sending of all the air to the Exhaust Shaft. The Panel 7 monitor is around 2000 feet from the shafts. This means that the WIPP officials were relying on any contamination to set off the monitor before any contamination went up a shaft. We need a layout of the monitors, and if they were working, in the underground. “For someone living in town, I would say the dose was probably zero,” Russell Hardy, director of the Carlsbad Environmental Monitoring and Research Center, an independent monitoring organization that is part of New Mexico State University, said in a telephone interview Tuesday. He said that the event would not add to background levels of radiation — including bomb fallout — any more than an eyedropper full of water would contribute to the rise in the level of the Pacific Ocean. There are over 70 cubic million miles in the Pacific Ocean. Meaning there are 188,000,000,000,000,000,000 gallons in the pacific ocean. That is 187 quintillion gallons. No problem, unless you eat the fish that drank that drop. Anyway, I don’t believe anyone knows how much radiation was released. The preliminary results are based on a ridiculously small number of air samples. The official projections are based on the implication that the samples represent the maximum contamination, which is unlikely. Even in the desert, the danger to humans was small, the mine’s operators said. The highest reading from the monitors indicated that a person could have inhaled radioactive material that would emit a dose, over the person’s lifetime, of 3.4 millirem, an amount roughly equal to three days of natural background radiation. But to get the dose, the person would have had to stand for hours in the desert, on the downwind side of the plant. Again, the official projections are based on the implication that the samples represent the maximum contamination, which is unlikely. We await the many soil samples that will shed light on the actual amounts. Bishop Oscar Cantú, Chairman, Committee on International Justice & Peace, U.S. Conference of Catholic Bishops, at “The Pope and the Bomb: New Nuclear Dangers and Moral Dilemmas” event on September 17, 2015, with moderator E.J. Dionne Jr., Washington Post columnist, former Sen. Sam Nunn, NTI Co-Chairman and CEO, and Prof. Maryann Cusimano Love, Associate Professor of International Relations, The Catholic University of America. Perhaps most alarmingly, the Panel recommended that congressional oversight be strengthened by having the DOE Secretary report to the Senate Energy and Natural Resources and Armed Services Committees, and to the House Energy and Commerce and Armed Services Committees. This would likely have the opposite effect, as it seems to preclude the traditional jurisdiction of the House and Senate Energy and Water Development Appropriations Subcommittees, which have provided key oversight in the past, and have often cut certain nuclear weapons programs. I publicly called on Heather Wilson to resign from that Panel because of her conflict-of-interests. She did not. To add insult to injury, the co-chair of the Panel is Norm Augustine, ex-CEO of Lockheed Martin. LM’s tentacles are very widespread. In the nuclear weapons complex, in addition to Sandia Labs it runs the combined Y12-Pantex nuclear weapons production contract ($2 billion requested in FY 2016) with Bechtel, as Consolidated Nuclear Security, LLC. Lockheed Martin gets slap on the wrist for lobbying violations in Sandia Labs contract extensions. Nuclear Watch New Mexico denounces the $4.7 million settlement agreement as a slap on the wrist for the world’s biggest defense contractor. Lockheed Martin clearly broke the law by engaging in illegal lobbying activities to extend its Sandia contract without competition, and engaged in deep and systemic corruption, including paying Congresswoman Heather Wilson $10,000 a month starting the day after she left office for so-called consulting services that had no written work requirements. There should be criminal prosecutions for clear violations of federal anti-lobbying laws, and Lockheed Marin should be barred from future competition for the Sandia Labs contract, expected next year.